One more day to go, and preparation started last week. What preparation did I hear you asked? Watching the Olympics on High Definition on TV. 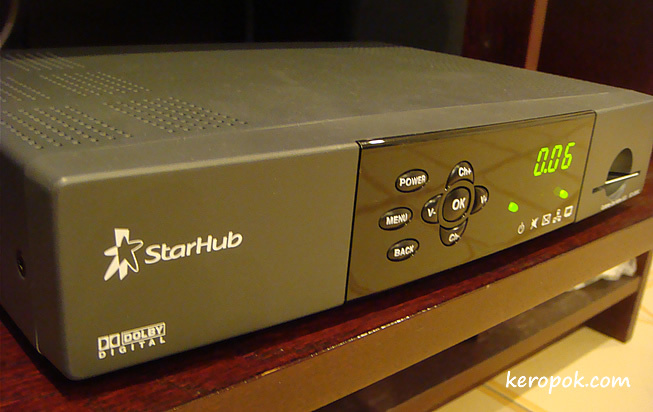 Many household, including ours, got the High Definition Set-Top Box from our cable TV company so that we could watch High Definition broadcast of the Beijing Olympics on the Free-to-air channel HD5. Plus we get 6 dedicated Olympic channels on cable TV too. Hmmm TV addicts rejoice! We are ready. HD Ready. 8 PM tomorrow! For those in Singapore, the HD5 schedule's here. Finally, there is more HD content here in SG... just a little at a time of coz! So what is the most popular TV show in Singapore? Good luck to the SG athletes. Who are the shining stars? how much do you have to pay for this HD box? Ya, the image quality is superb. enjoyed it on Ch 300.